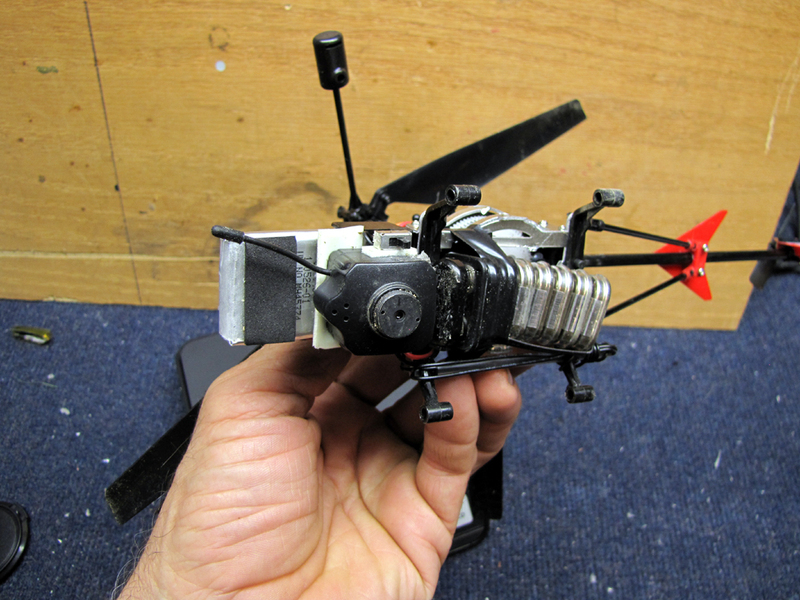 RC Helicopters are very popular right now and cheap! I picked this one up one at Radio Shack for $60 and they can be had at Costco even cheaper. I thought it would be a good challenge to see if I could get a wireless video camera airborne and shoot some video of the flight! 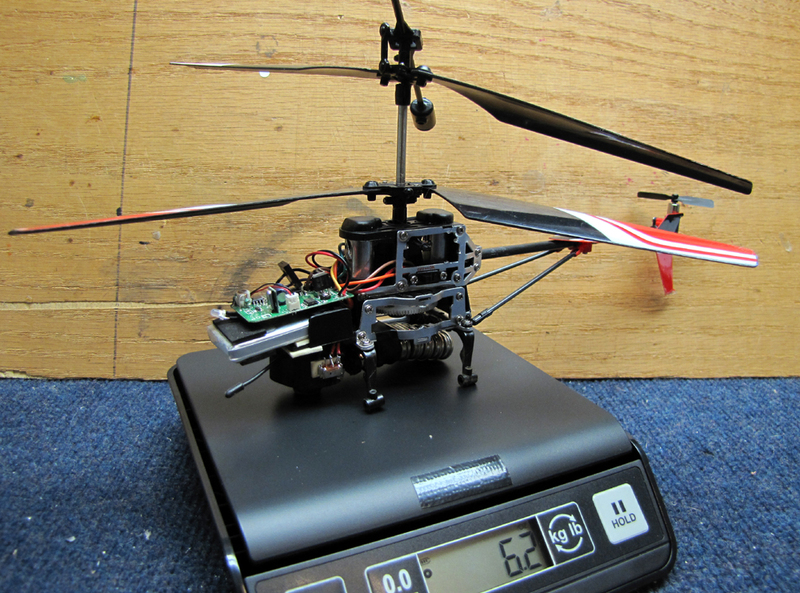 I did a few load tests and found that the maximum payload that could be lifted with this helicopter was 2 ounces. After a lot of hacking, I managed to shave enough weight off to get the thing to carry the camera and 9 volt battery. I got a few flights and some video recorded just before it started to rain but the project was a success! 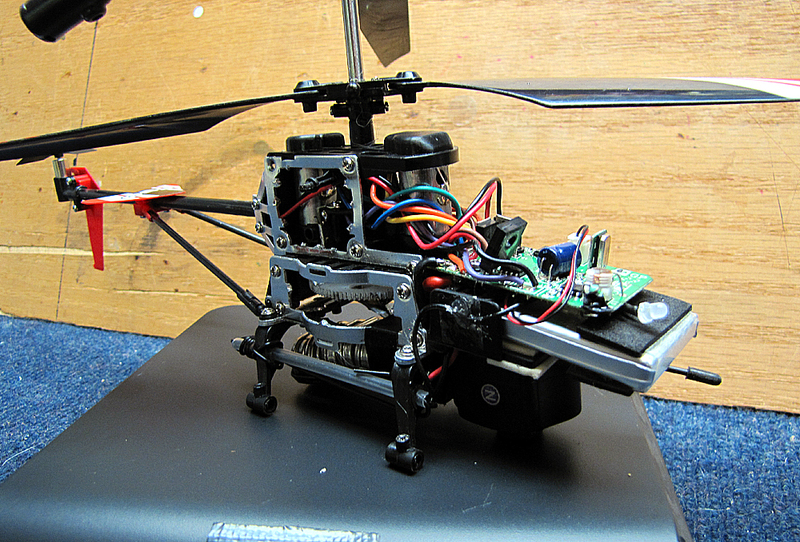 I learned a few things about this class of RC helicopters while working on this project. They have a fairly short flight time and they aren’t that maneuverable. The flight time is something you have to live with but the lack of pitch control can be corrected. There’s a device at the top of the rotor shaft called the fly bar. It’s purpose is to add stability and it does this through the use of weights at each end which create a gyro effect. I found that if I removed the weights it allowed a much great change in pitch and thus in maneuverability of the craft. Watch the video for the full explanation and some video from the helicopter. Get one of these and a wireless camera and have some fun! Very cool implementation. Have you tried one of those car-fob cameras? They are much lighter, and have a built-in lipo battery, but you need a micro-sd card. If you don’t need real-time monitoring, this is the way to go. The cheaper 480×620 resolution cameras go for around $6 including shipping from China.